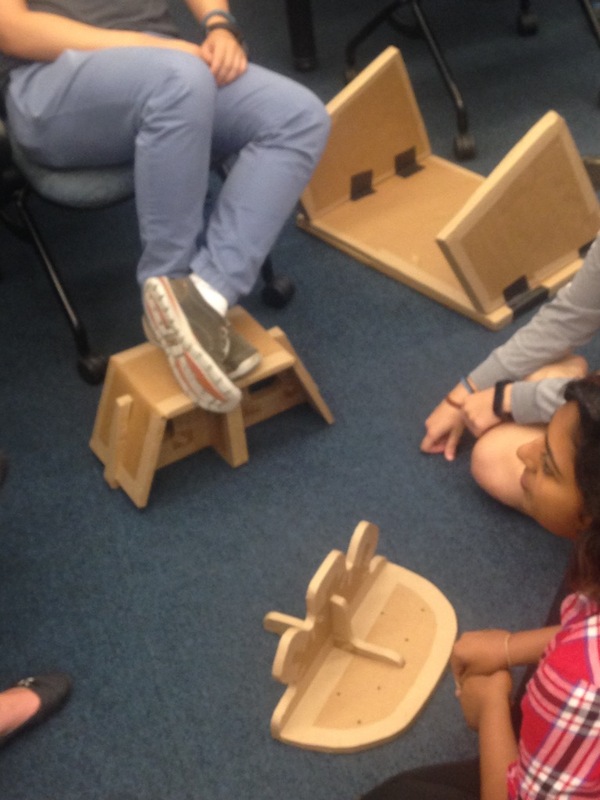 Students sit on cardboard furniture and adaptations tailored to their own bodies: standing desks, custom stools, and more. A cardboard chair from Perkins School for the Blind, with adjustable foot rests for customized support. We’re working as a satellite site of the Adaptive Design Association, a New York City non-profit that builds accessible, low tech adaptive furniture and devices for young people. After Sara took the three-day intensive course in New York City and did independent research and training with its counterpart, the Assistive Device Center at the Perkins School for the Blind, ADA invited the a+a lab to form local partnerships of our own—to spread these basic fabrication techniques, but mostly to foster a disposition toward human difference and atypicality: a disposition toward affordable materials and customized adaptation for individuals, not at scale. Alex Truesdell, director of ADA, describes the properties of cardboard to Olin students. ADA director Alex Truesdell, who got her start in occupational therapy at Perkins, came to visit Investigating Normal in the spring 2015 class. She introduced students to the history of ADA’s work and client-partners, spoke about the incredibly robust properties of a humble technology like triple-wall cardboard, and walked students through some basic techniques. ADA and Perkins both deliberately create workshops that are radically democratized, on purpose: they use the back handle of a spoon for scoring folds, and sharp kitchen knives for some of the cuts, and simple wooden dowels for nails. (And band saws, and jigsaws, and clamps and glue.) It’s designed to be a place for anyone to access with an idea for altering or replacing the designed products we typically receive from mass manufacturing streams. 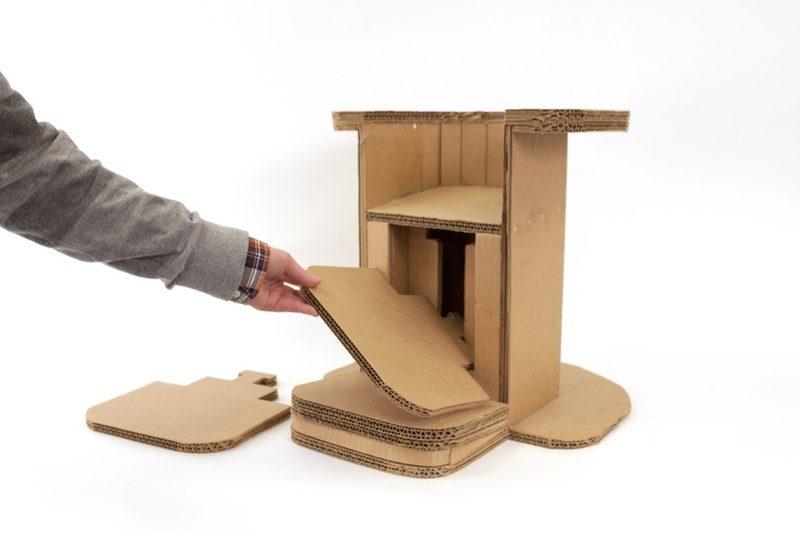 Pieces of cardboard slot together for a simple stool. ADA partners co-design and fit a chair for a small child. A child rides an adaptive wheeled riding toy, made of cardboard and PVC pipe. That means that a student or anyone in her ecology of care can have an idea, try something out, see what works: a parent, a teacher, a clinician, anyone. And the materials and labor—robust but affordable, and quick to assemble—mean that missteps and failures aren’t catastrophic. How can you tell if a young person who’s non-verbal and has complex mobility constraints will respond well to a chair or support structure? You can try it out and see, build to learn, start over if needed. Students in my lab and classroom are invited to see this work as engineering, no more and no less. It’s powerful to include low tech devices under the same engineering canopy with robotics, circuitry, and code. Engineering is for people, and so often the elegant, just-enough solution is one that people are asking for. One they can then alter and change and adapt as needed. The basics of cardboard carpentry are now a standard part of Investigating Normal, where students are invited to look around their own built environments and find a mismatch for their own bodies or preferences. It’s another powerful embodiment of engineering for everyone: locating oneself in the human continuum of needs. They build lap desks, stools, coat racks, and more. 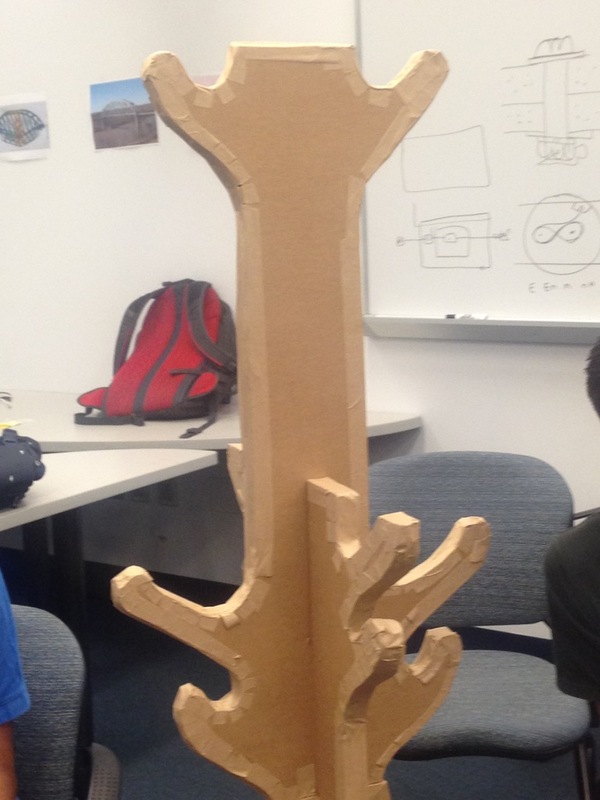 Students show each other the designs they’ve built to adapt their environments. This coat rack, tree-style, was a favorite in fall 2015. The work continues! Lauren Froschauer ‘16, an Investigating Normal alum, conducted an independent study and training in cardboard carpentry in 2015-16. She completed the ADA’s intensive workshop and months of volunteer time building at Perkins. She also reached out to Newman Elementary School, another community organization, to co-design furniture for children there. Investigating Normal is now set to collaborate again with Newman in the fall; more news to come.